Time is ticking by and your essay deadline is looming. Your tutor, Professor Moriarty, has set you a truly obscure essay question and you have no idea where to start. Clearly this is all part of some evil conspiracy to stop you from getting the great grades you deserve. Then it occurs to you – brilliant! All you need to do is track down (quickly!) the research of other great minds on the topic, show how your own even greater mind can engage with their research and you will have the basis of an outstanding essay. The game is on! So… is it on Google? But time is short and how are you going to find that great research? Easy. Google is the quickest place to look for everything, right? It’s where everyone looked to try to work out exactly how Sherlock faked his own death at the end of series 2. It’s where you have just searched to get screening times for the Hobbit: Desolation of Smaug at the Warwick Arts Centre Cinema. Why shouldn’t it be the place for your essay research too? You go to Google and type in some terms. Your essay is on gang crime, called thuggee, in Victorian literature, so you type in thuggee and victorian and hit search. Instantly you get loads of results… great! Actually, there are 235,000 of them… hmmm… Suddenly the task of locating those choice pieces of brilliant, highly relevant research looks a bit more daunting. You scan the first page of results and then the second page, and your heart sinks yet further. You find a site called damninteresting.com, which might well be, but would be a tricky one to reference, whilst attempting to demonstrate your natural brilliance! When you look hopefully at the references at the end of their site, you find Wikipedia and an online encyclopaedia called unexplainedstuff.com. The next one you click on is called Hudsonhousemysteries, and turns out to be another enthusiast’s blog, this time with no references whatsoever. tick tock tick tock… Your heart is racing. You can’t let Moriarty win! Think!… What would Sherlock do?? Is it on Google Scholar? 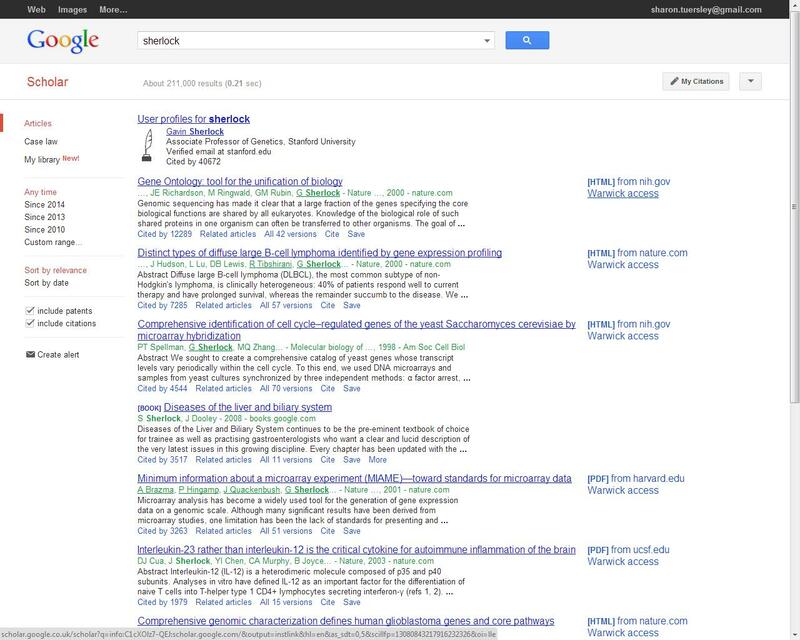 Well, Sherlock would probably have discovered Google Scholar and quickly set up his Library Links to show him at a glance whether Warwick had access to the articles on there (instructions available under the Google Scholar link here). He would then type in his terms and look down the right hand side for the Warwick Access links that take him straight to the articles the university has a subscription to. But is this the only thing Sherlock would do? No. Because, Sherlock prides himself on knowing things that others do not. This means he can see through Google, and even Google Scholar, as a resource for the common man and not the true scholar. He knows that of the 86 billion pages on Google, only a tiny proportion will come close to what you need to find for your essay. So, what does Sherlock do? He goes straight to the page of Library databases go.warwick.ac.uk/lib-databases, which he has remembered from his induction sessions, unlike most of his fellow students who were understandably, asleep or hungover at the very least. He scans rapidly through the lists of recommended databases and selects 3 or 4 key ones. A few moments taken to plan his most useful search terms and of course use the advanced search (what else?!) and Sherlock is happy! Nearly as happy as if he had just found a new serial killer to pursue. You try the same and, amazing, you have a manageable set of results, that are academically sound and relevant to your topic. Referencing any of those is bound to win you marks, even from the most evil and nitpicking of professors! Now all you need to do is have a quick read and devise your own original thesis in response. But, stay in Sherlock mode, and it will be elementary! Sign up for the Skills Programmes run by Student Careers and Skills to work on skills such as academic writing, critical engagement and time management. Take a few minutes to choose the best search terms. This will save unnecessary and frankly boring messing around with unhelpful results. How are people writing about your topic? Might they be using different words? Are there variations in spelling/terminology, e.g. British v American? Top research detectives will also know that * at the end of the word finds all possible endings, so thug* will find thug, thugs, thuggee… Brilliant. Keep a record of your terms. If you are a genius consulting detective these will scroll magically before your eyes and live forever in your mind palace. If you are not, you may need to create a list, chart, mind map… Anything to keep them to mind while doing your searches. Think about how your terms connect. Do you want to find any of the terms or all of them? Databases are not as clever as you, and won’t know this automatically, so you need to make it very clear. Use OR to connect synonyms/alternatives which you want ANY of (e.g. thug* OR gang crim*), AND for when you want to find ALL of your terms (thug* AND Victoria*). Use the subject-specific databases for your area and always use the advanced search. It sounds harder but it isn’t, and it allows you to organise each search concept on a separate line, as well as specify where you want to search for your terms: in the title, abstract, subject etc. Much more efficient! Make the most of hyperlinks from useful results. You can use them to link with one click to other works by the same author and/or on the same subjects. Detective work just got a whole lot easier!